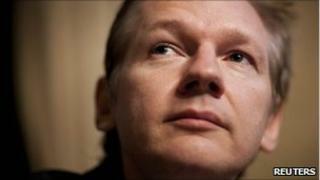 Ecuador has offered Julian Assange, the founder of the whistle-blowing website Wikileaks, residency in the country. Deputy Foreign Minister Kintto Lucas said his country's government wanted to invite Mr Assange to Ecuador to give him the opportunity to speak publicly. He said Ecuador was concerned about some of the alleged American activities revealed by Wikileaks. Earlier this year Sweden refused an application from Mr Assange, who is Australian, for residency there. "We are open to giving him residency in Ecuador, without any problem and without any conditions," Mr Lucas said. "We are going to try and invite him to Ecuador to freely present, not only via the internet, but also through different public forums, the information and documentation that he has," he said. Mr Lucas added: "We think it would be important not only to converse with him but also to listen to him." Wikileaks says it has more than 1,600 cables that originated from the US embassy in the Ecuadorian capital, Quito, the contents of which have not yet been disclosed. Mr Lucas said Ecuador was "very concerned" by information revealed by Wikileaks linking US diplomats with spying on friendly governments. He said the offer to Mr Assange would not affect relations between Ecuador's left-leaning government and the US. On Monday, the authorities in Australia said they were looking into whether Mr Assange had broken any laws there. The Spanish paper El Pais says that, according to a secret cable released by Wikileaks, US intelligence operatives wanted to know whether the Argentine president, Cristina Fernandez de Kirchner, was taking medication to deal with her "nerves and stress". The message asked: "How do Cristina Fernandez de Kirchner's emotions affect her decision-making and how does she calm down when distressed?" The state department cable, dated some 10 months ahead of the death in October of her husband - the former president, Nestor Kirchner - also asked whether she shared his "adversarial view" of politics. Venezuela's President Hugo Chavez praised Wikileaks and called on US Secretary of State Hillary Clinton to resign following the latest Wikileaks revelations. "Somebody should study Mrs Clinton's mental stability", he said and added: "It's the least you can do: resign, along with those other delinquents working in the state department." Another document published by Wikileaks, dated January 2008, detailed Brazil's co-operation with the US on counter-terrorism. In it, the then US ambassador to Brazil, Clifford Sobel, informed Washington that the police often arrested individuals with links to terrorism but charged them with drugs or customs offences so as not attract media attention. Brazil has a sizeable Arab population and has publicly denied taking part in counter-terrorism operations.